Card deck memorisation - post your times here! 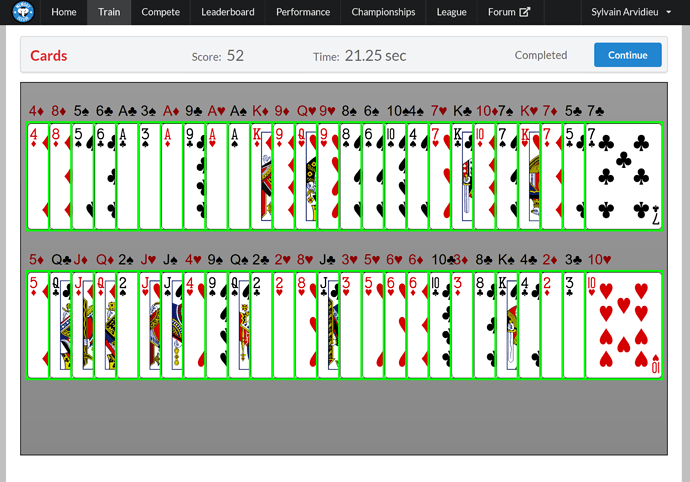 I finished making all the final changes to my images, so I think the next step is to improve my recognition speed of card pairs. In every deck there are still several pairs that trip me up, which destroys my time. I just got a time of approximately 2 minutes without errors, so that’s encouraging. Error frequency is dropping steadily. If I could just elicit each image immediately, a sub-1-minute time would be quite manageable. Alright, Shasan and I are taking over this thread to push each other to sub - 20s we’ve warned each other that we have other important things to do at the moment, but hopefully this will help motivate us! That’s ridiculously fast. Good luck to both of you! 2:51 is impressive. I assigned a famous person for each card and used 52 locations in my house. I walk thru it and recall all 52 cards successfully. I was very happy and my wife was very impressed with me. But the problem was It took me 17 to 18 minutes to do it. May be , my technique is a slow one. So, I want to switch to PAO method. will that improve my time ? May be , my technique is a slow one. So, I want to switch to PAO method. will that improve my time ? I don’t claim to be an authority on the subject, but I think anybody would agree that a 52-image system can be very effective. With practice, times below 30 seconds are definitely possible. If you’re considering switching to PAO, I would start by gathering some data comparing times of people from each group (52 images and PAO). If you find that PAO is consistently favored, then maybe make the transition. Honestly though, I doubt there’s much difference between the two as far as viability. Thanks for your input. Iam going to stick to it. Currently, my time is a embarrassing 18 minutes. But I love the technique.I will work on it and let you know the progress. I’m going to practice intensely the next week. reviewed my images 40 times. Goal: break sub50 in 1 month. Such an insane baseline ! It will be interesting to follow your progress. Also can you detail which technique you use to memorize ? And happy new year to all of you ! How did you review your images ? Did you do it in one row or did you spread that over the day ? I’m also trying to improve that aspect of my technique. I would appreciate some tips ! Corbanicum, use ctrl+f and type JoeMantegna, you will find the entire method I used to get sub20 in 20 days doing only 3 decks a day. The thing you wan’t to do if you want to get better is insanely get out of your comfort zone. That way your brain can adapt. That’s what I did. If it’s hard, you are getting better. But It was too much. I improved my image recognition? Yes. A lot. Like from 1:00 to 27 in 50 minutes. I usually read 1-2 hours a day, but today I couldn’t even read 5 pages correctly. Best tip you can get to improve fast is to meditate 20 min a day. Guaranteed. If you want the real example, I was at 5min plateau for a week and started meditating day 14 (20min headspace). Not even talking about the other 1000+ real life benefits aswell. Also, play on memoryleague. You will practice 10x faster. Always be Replacing your images until you have a solid system. Practiced (tried) and couldn’t do anything. 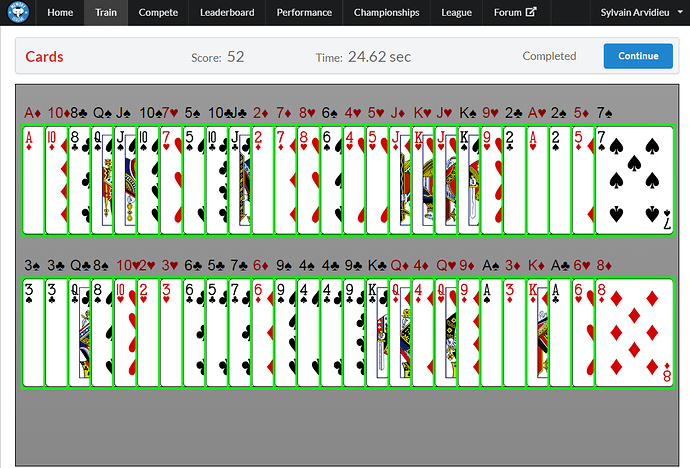 The only thing I did was memorizing 28 decks in 60 seconds and then feeling really tired. And if you want a little hack to improve your time instantly, raw memorize the 3 cards before the last and don’t look at the last card. Put them in the memory palace in the recovery time. I could finally muster a sub-30 today, 29,18s, first time since Vienna, after which I took a bit of time off. My previous Cards strategies seemed to lead to my losing a lot of speed and confidence after just a few days off. I’m working on new ways of keeping my images fresh and consistent without needing to worry as much about taking days off, we’ll see. Edit: slowly but surely … 26.52s. Two successful decks under 30s and two tricky ones over 30s. Not completely stable yet! Edit 2: marginal improvement again for 2019: 26.23s. Sub-twenty will take a while! Long time no post here Getting closer to the target!